The various components in an engine can become damaged or worn out over time, but you need them all to function well in order to maximize engine performance. If you have spotted signs of damage to your engine and you have narrowed down the issue to a problem with your injector, you may be actively searching for Detroit Diesel injectors to use with your repair or maintenance needs. The good news is that you do not need to drive all the way down to a local store because you can order your injectors online right now through Diesel Pro Power. We are the Detroit Diesel engine parts dealer that you can count on for all of your vehicle and marine part needs, and we are ready to begin working for you today. 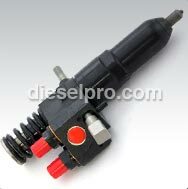 To begin your search, you simply have to complete an online search query for your Detroit Diesel injectors. Type in your parts number or model name, like 6V71 or 16V92, and you can easily find the part that you need. We strive to carry all injectors and other related engine parts in stock. These are high-quality parts that are designed to provide you with years of use, and they can be shipped to your location without hassle. If you need additional supplies, such as tools for installation or replacement, we also carry those. We want to be your one-stop shopping resource for all of your shopping needs, and we are excited to provide you with the extra parts that you need for your engine repair needs. Regardless of where you are located, you can count on Diesel Pro Power to carry the parts you need and to ship them to you in a timely manner. With worldwide shipping available, you can always trust us to get the engine parts you need delivered to you without delay. You can use our website today to order the parts you are currently looking for. After you have experienced how convenient and easy we make it to get the parts you need, we will continue to be the resource you use for your future auto parts needs. Could frequent stalling be attributed to fuel injectors? Yes his can be caused by leaky spray tips or improper timing. If you suspect this is the culprit, the injectors should be replaced as soon as possible. I have low oil pressure, is this related to the injectors? It can be due to a malfunctioning injector seal ring. This would lead to fuel leaking into the lubricating oil. One way to check for this includes smelling the lube. The smell of fuel oil should be easily identified. The fuel inlet and outlet pipes and fuel manifold connectors. Can you replace certain parts of the injector, without replacing the whole unit? No, the injector is vital to proper engine performance. It is designed to be replaced as an entire unit, and so if one is malfunctioning, the best thing to do is purchase a new injector. In order to replace the injector, first remove the rocker cover, then the fuel lines and connectors. Then, loosen the two rocker arm bracket bolts that hold the brackets. Swing the rocker arm away from the valves and injectors. After removing the injector, washer and its clamp, use the injector tool to pry the injector loose. After lifting the injector out, disengage the control rack from the injector’s control tube.